All prices on G-7. Crown Trading Co. Ltd Website are FOB. Freight, Insurance (if required), Shipping Agent Fee, BL Fee, DHL Charges, THC, Vanning and Repair will be charged in addition to the FOB price. Year and Month mentioned for the cars are date of First Registration in Japan and indicate Date of Manufacture. Inspection will be charged separately (if required). Vanning and THC will be charged additionally, if shipment is made by container. Any other additional cost will be added to the invoice. No credit facility is available. No car will be reserved until 50% of total invoice amount is received. 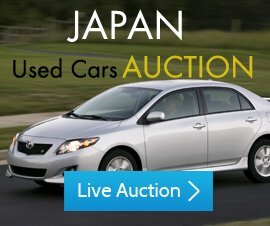 For special car orders, Minimum JPY 100,000 has to be sent as security deposit for under worth of Vehicle JPY 1,000,000. Customers are requested to settle advance payment latest by "Payment Date" mentioned on the Pro Forma Invoice. In case where payment is delayed G-7. Crown Trading Co. Ltd reserves the right to cancel the order. Any advance payment which is received after the "Payment Date" as per Pro forma invoice can either be refunded to the client or adjusted against a fresh order. The payment must be credited in the account designated by G-7. Crown Trading Co. Ltd During this period and the copy of T.T has to be emailed or faxed to our office fax no. in Japan for account reconciliation. In the event were balance payment is not credited in to G-7. Crown Trading Co. Ltd's designated account within two week of shipment G-7. Crown Trading Co. Ltd will reserve the right to cancel the order. In this case advance payment made earlier for the same order will not be refundable to client. Original B/L and other export related documents shall only be sent over after receipt of full or remaining balance payment. Cancellation of bought vehicle(s) will incur cause a cancelation fee. G-7. Crown Trading Co. Ltd must receive full invoice amount without any bank deductions. All bank deductions must be born by the buyer. Customer will be responsible to confirm the import law and costumes duties with the authorities in your country before you make a purchase from us. G-7. Crown Trading Co. Ltd will not be responsible for any claim related with such rules. All customers should send the payments only to G-7. Crown Trading Co. Ltd, Beneficiary in JAPAN only. We will not responsible until payment confirm from our bank. G-7. Crown Trading Co. Ltd Terms and Conditions could also be updated without any prior notice.